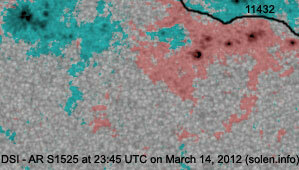 The geomagnetic field was quiet to unsettled on March 14. 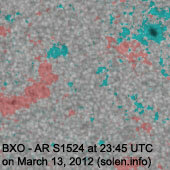 Solar wind speed at SOHO ranged between 446 and 572 km/s. 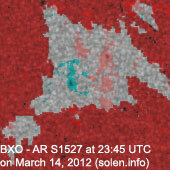 Solar flux measured at 20h UTC on 2.8 GHz was 118.8 (increasing 15.6 over the last solar rotation). The planetary A index was 8 (STAR Ap - based on the mean of three hour interval ap indices: 8.1). 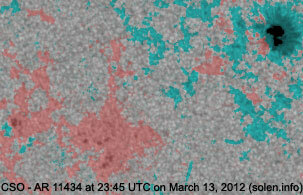 Three hour interval K indices: 32012323 (planetary), 22222322 (Boulder). 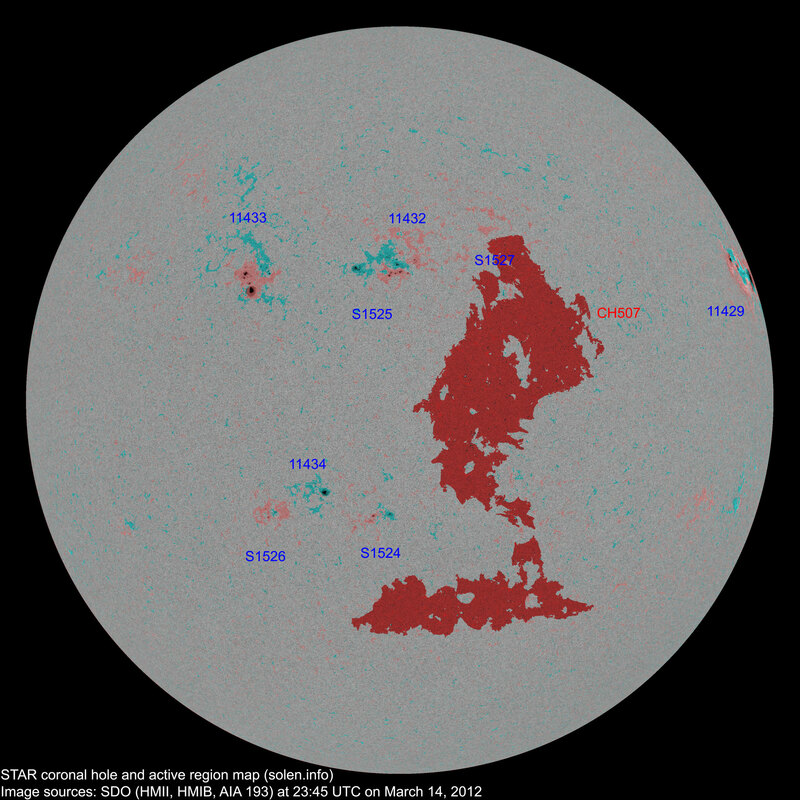 Region 11429 [N18W79] decayed slowly as it rotated to the northwest limb. 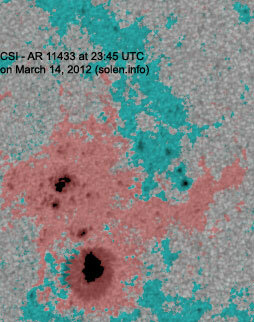 Another major flare is possible while the region is transiting the limb. 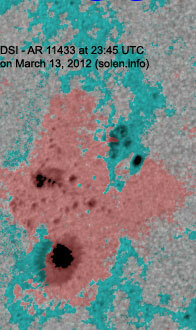 Region 11433 [N13E24] lost a few spots and has weak polarity intermixing. Region 11434 [S22E13] decayed slowly and quietly. 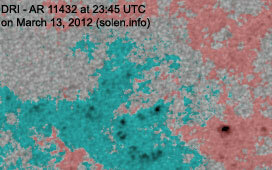 Minor update added at 14:40 UTC: Regions 11432/S1525 again managed to produce an M class flare, M1.8/1F at 07:52 UTC. 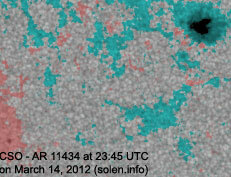 This time a weak type II radio burst was associated with the event. 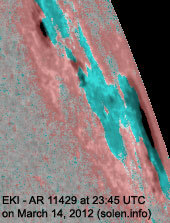 A small and apparently Earth directed CME was observed in STEREO imagery. It is very unusual for regions without mature penumbra to produce M class events, in this case it's interaction between opposite polarity fields in two nearby regions causing the events. 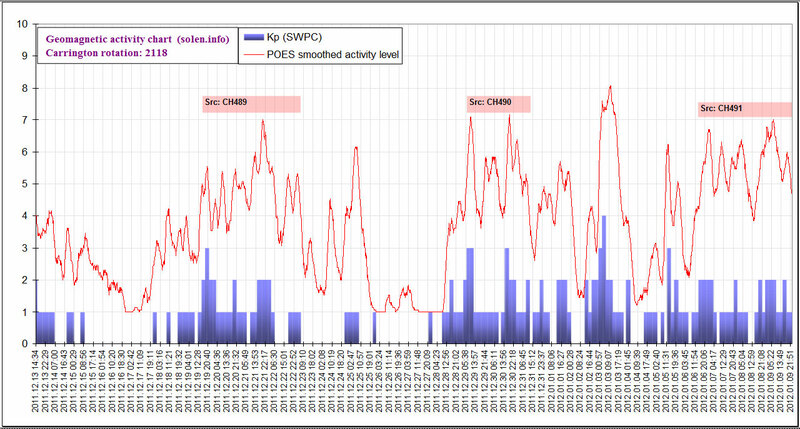 The CME observed on March 13 arrived some hours earlier than expected, solar wind speed and density increased quickly near 12:30 UTC at ACE. 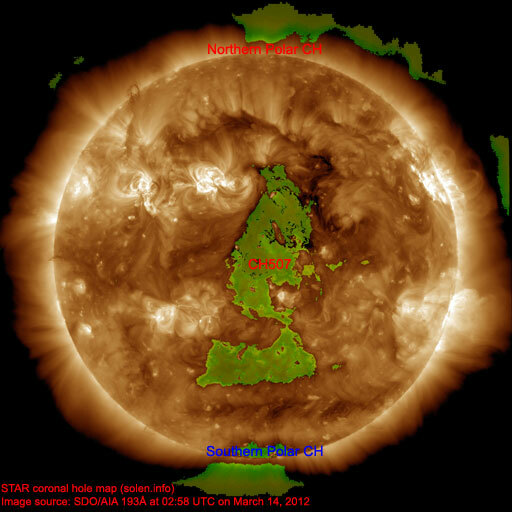 Active to major geomagnetic storming is possible for the remainder of the day and the first half of March 16. Interestingly solar wind speed had been increasing slowly since 05h UTC today, likely caused by the arrival of a high speed stream from CH507. 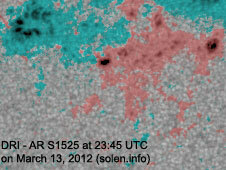 The poorly defined solar wind shock is probably because of interaction between the high speed stream and the CME. Currently solar wind speed is above 700 km/s. 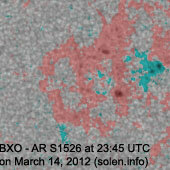 Two new active regions are visible as this is written. 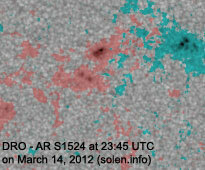 S1528 is rotating into view at the southeast limb (S13E83) and S1529 is emerging in the northeast quadrant (N16E47). The latest high res. CHARMAP. 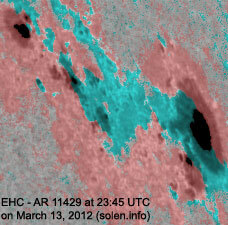 March 12 and 14: No obviously Earth directed CMEs were observed in LASCO and STEREO imagery. 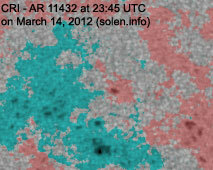 March 13: The M7 event in region 11429 was associated with a halo CME which could reach Earth late on March 15 or early on March 16. 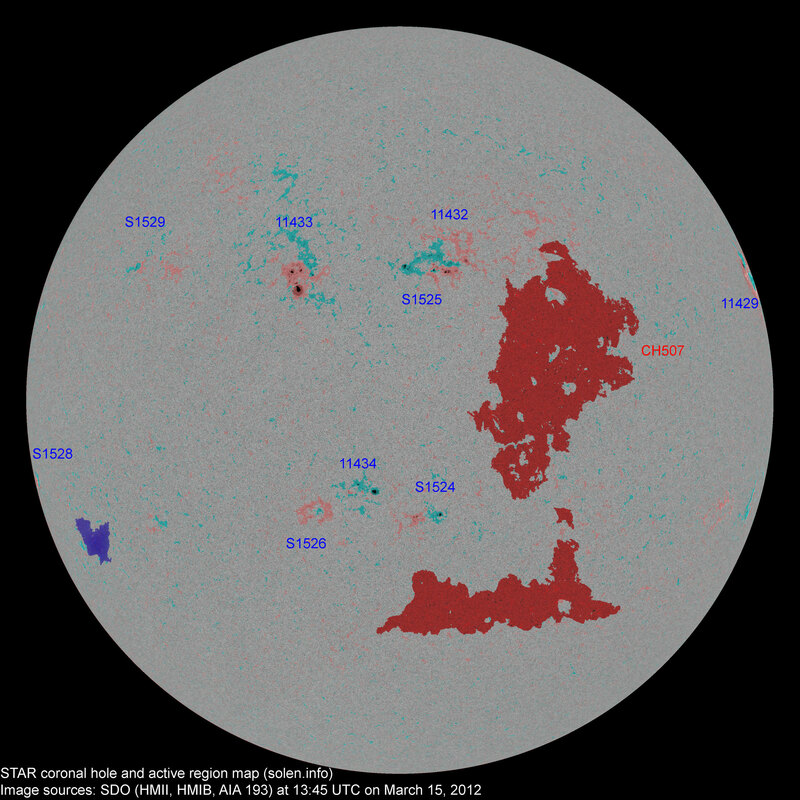 The geomagnetic field is expected to be initially quiet to unsettled on March 15. Late in the day or early on March 16 the CME observed on March 13 is likely to arrive and cause unsettled to minor storm conditions, major storm intervals are possible. A high speed stream from CH507 in combination with the mentioned CME could cause unsettled to minor storm conditions on March 16-17.